The Yucatan Peninsula is a lovely place to spend a vacation, especially during the winter months. The coastline is filled with unique areas, and there is plenty to see and do. Whether it’s for a honeymoon or a family vacation, there are many reasons to visit the Mexican Caribbean. 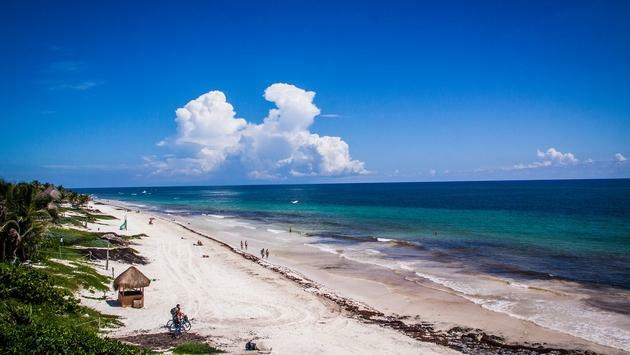 This area has countless stretches of beautiful white sand beaches—from Playa Mujeres and Cancun down to Tulum and over to the island of Cozumel. It’s a great destination for long days spent lounging on the sand and afternoons spent snorkeling off the coasts. The Mexican Caribbean boasts some of the most picturesque sunrises. Early risers will enjoy a morning of watching the sun emerge from the water as the waves gently crash on the shore. Each daybreak brings a new set of colors painted across the morning sky. There is no shortage of resorts in this destination. Visitors can choose from adults only, family friendly, boutique, high energy and the list goes on. Each area offers a different vibe. For example, the resorts in Cancun tend to lean more towards the high energy and party atmosphere while the resorts in Tulum are more on the quieter side. Visitors have several day trips to choose from throughout the Mexican Caribbean. There are exhilarating excursions such as zip lining and ATV riding and more low-key options like horseback riding and snorkeling. For even more relaxing options, one might choose to visit a cenote or the Mayan ruins. There are a few airports to choose from, but most coastal locations can be visited starting with a flight into Cancun. From there, it’s between a 15 minute and couple hour drive to get almost anywhere in the area. Direct flights are available from Cancun International Airport to several airports throughout the US and Canada. These reasons, along with many others, make this an ideal area to travel to for vacation.